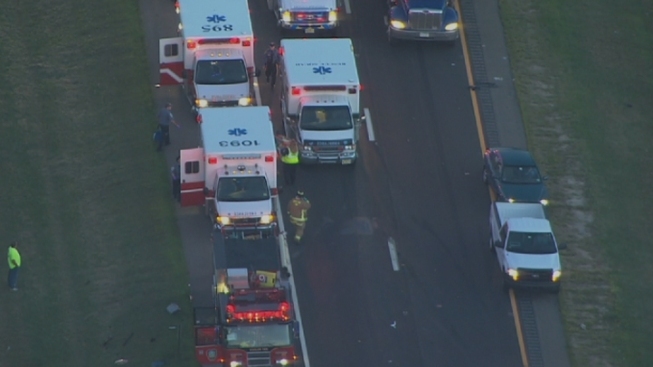 Multiple people were injured in an accident on the Atlantic City Expressway in Winslow Township early Friday morning. Skyforce10 was over the scene of the accident involving four cars -- a Toyota Sedan, a dump truck, a Ford pickup and a Honda sedean -- on the eastbound side of the Expressway just pass Berlin Cross-Keys Road. Police say the Toyota rear-ended the dump truck before it overturned. The Ford pickup and Honda then hit the Toyota. Five people were injured. Three of those injured are in serious condition. The other two were treated at the scene. Both lanes of the expressway east were shutdown for some of the morning rush. No one is charged in the accident.